Safety eyewear specialist Riley® has enhanced its highly popular STREAMTM range of safety glasses with the launch of the new STREAMTM EVO. Featuring a sports style frame with high performance impact-resistant F-rated polycarbonate protective lens as standard, the new STREAM EVO is also ultra lightweight and highly comfortable, ensuring high wearer acceptance. Suitable for use across a wide range of industry sectors, STREAMTM EVO also offers a comprehensive range of lens options available for different working environments to ensure clarity of vision for the wearer. The enhanced Riley TempFLEX™ system – flexible, Thermoplastic Elastomer (TPE) side arms and temple tips, inclinable temple mechanism, adjustable nose bridge and length adjustable temples, enables the wearer to create a high comfort, tailored fit for their individual face shape. STREAMTM EVO is also available with a separate accessory pack , containing an adjustable headband and gasket. The robust polycarbonate wraparound lens gives a clear panoramic view, ensures high performance protection from impacts and delivers perfect optical quality in accordance with EN166. Twilight – designed to improve contrast and colour perception in low light conditions particularly for outdoor workers at dawn or dusk. Will also filter out more than 75% of blue light, the component of visible light most difficult for the eye to accommodate - reducing stress to the eye. Anti-Reflective (AR) – ideal for workers in bright environments, AR lenses also eliminate reflections from the front and back surface of the lens providing better vision for night driving and improved vision for computer use. Blue - enhances vision in the presence of excessive yellow light environments such as nighttime street lighting. Clear - provides true colour recognition and are ideal for general purpose indoor and outdoor work in normal to low light conditions. Grey - reduces brightness, minimising eyestrain in moderate to bright environments, making them ideal for daytime wear or outdoor tasks. Supporting the range even further is Riley’s ‘On-Sight' Service which includes Riley’s fully trained Optometrist and state of the art, mobile optician vehicle. This makes testing the eyesight of workers on site easy, saving time and money. The full Riley RX Prescription Service also enables workers requiring prescription safety glasses to have higher impact Polycarbonate lenses made specifically for them by Riley’s in-house laboratory. 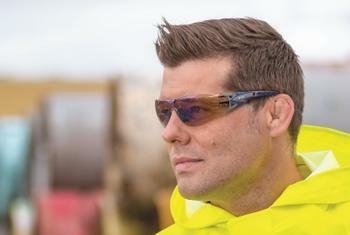 “STREAM EVO builds upon the highly successful STREAM range of safety glasses with enhanced innovation and wearer features to further increase user acceptance, comfort and performance and of course deliver exceptional safety through the use of impact resistant polycarbonate lenses as standard,” said Peter Bartholomew, Riley Product and Brand Development Director. To find out more call the Riley team on 0161 877 4747 or email info@riley-eyewear.com.